Last Thursday, I received a delightful and unexpected email note from Dawn Hanson – a bride of mine from almost three years ago. I so fondly remember Dawn and her husband, Rob. 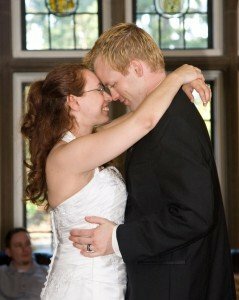 They were married on a very hot week-day afternoon in August 2009, at Thornwood Castle in Lakewood. I was thrilled to learn they are so very happy in their relationship and are growing and learning, together. As I shared with Dawn, it’s always funny what I remember. I remember taking a little shade under a big tree before their ceremony. Looking up, I smiled when I saw Dawn peeking out of an upper floor window. This I remember and have thought about during other visits to Thornewood Castle throughout the past 3 years. “Annemarie – you did an amazing job officiating our wedding and I just wanted you to know that Rob and I love the Keepsake Box and love letter idea so much; we tell all of our friends about it when they are thinking about ideas for their weddings. Rob and I write love letters to each other every year and read them on our anniversary. I just wanted to take a moment to say “thank you,” again.